With a preponderance of evidence that learning variability matters and increasing numbers of educators acknowledging the importance of inspiring optimism in the face of learning challenges, we find ourselves faced with the profound opportunity – and responsibility – to design learning that empowers all students for success. What educators, parents, coaches, after school providers, and others who work with growing learners need now are tools and strategies to translate these understandings into realities for the classroom, home, and the many places young people engage in learning. That’s why we’ve been pleased to contribute to The Friday Institute for Educational Innovation’s Learning Differences MOOC-Ed. This free massive open online course launched last fall, with over 1,000 participants from 40 countries. Chock-full of resources and interactive activities, the LD MOOC-Ed was an unequivocal hit. So we’re equally pleased to announce the six-week LD MOOC-Ed will once again be open, beginning February 9, 2015. All of us, children and adults alike, have different strengths and weaknesses in our learning. Historically, however, schools have approached student learning with a one-size-fits-all mentality and have struggled to adapt to changing student needs. That ends now. Deepened your own understanding of learning differences and the related constructs of motivation, executive function, and working memory. Explored relevant strategies for supporting students with learning differences. Applied strategies in your classroom and provided a more personalized learning experience for all of your students. The Learning Differences MOOC-Ed is designed for educators including teachers, coaches, administrators, or allies who play a role in meeting the needs of all students. 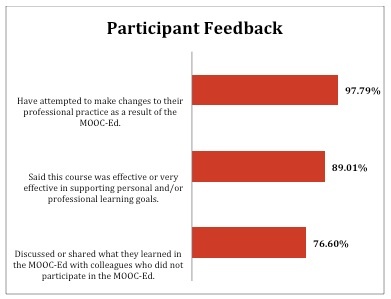 I believe the most valuable aspect of this MOOC-Ed was the chance to hear from others throughout each module, to hear from actual students who had learning differences, and to be able to obtain and add more strategies to my tool box to help the students I interact with. I enjoyed the ability to print out info and articles to use as a reference and tool. I loved that I could work at my own speed and other people in my building were participating so we could have discussions! I have been able to apply strategies to accommodate more time for some students, chunks of work and guided notes for those with working memory difficulty, and cues as well as rubrics to help students to self-monitor. I have started focusing on students’ strengths instead of weakness. Learn more about and register for the LD MOOC-Ed here. We thought you would enjoy this repost from the CLC Network’s Blog by Doug Bouman. I think the reason I struggle in school is I have no motivation, no goal, nothing that tells me to keep going. Some kids have legitimate reasons for their school struggles – not me. I am just lazy and it is 100% my responsibility to dig myself out of this academic hole I have created. If I don’t improve you should pull me out of sports and eliminate all the things that mean a lot to me because I don’t deserve them. When students misunderstand in school and are misunderstood by adults, things frequently get tense –inside the student and also between the student and parents and/or teachers. Inside them it can feel confusing, frustrating, or discouraging. Eventually, these feelings often lead to self-prosecution (e.g. I’m so stupid, I just can’t do it, etc.) Between the adults and students tensions may quickly increase as “nothing seems to work” and parents and teachers display ever-increasing frustration and discouragement. How does this happen? Why? Reasons for student misunderstanding and adult misunderstanding of their misunderstanding are multiple. One possibility to consider is that the adults play out their autobiography into the life of the child. What does that mean? Without realizing it, we adults assume the student is us. So the automatic, default reason we lean on to explain the student’s misunderstanding or struggle in school is often the reason we (adults) might have struggled ourselves. This autobiography mindset often misses the mark, leading to misinterpretation. For example, if a parent had no trouble in school, they may interpret their child’s struggle as laziness. So what might this misunderstanding sound like around the home front? How about – “I know you are smart… I know you can do this,” or “You need to try harder – get motivated.” Yikes. This process can heighten and tighten leading to a “triple whammy” for the student. Whammy #1 – The student is struggling in school, knows it, and recognizes that they are disappointing the very people s/he is trying to please. Whammy #3 – The default reason everyone else is giving for a students’ misunderstanding or struggles in school is because they “don’t care… aren’t trying… aren’t motivated.” After a while, the student may even believe the misunderstandings of the adults in their life. Parents can remain open to a variety of explanations/interpretations for the student’s struggles. One particularly helpful book is A Mind at a Time by Mel Levine, M.D. Parents can help their student by emotionally “shock absorbing” the situation. Amidst their struggle of misunderstanding, the student really needs the adults in their lives to really behave as adults — to absorb some of the emotion flying around by remaining calm — easy to say, not so easy to do. Seek further comprehensive evaluation from CLC Network as a foundation for accurately understanding their misunderstanding, getting adults and the student on the same page and putting a specific plan in place which includes steps for parents, teachers and the student. Ultimately, misunderstanding a student’s misunderstanding is understandable. And once we realize this, we can move forward to understanding our students’ struggles, to using that understanding to equip rather than guilt, and to making education meaningful and achievable for our kids. The first thing comics offer is a hook. If your young student struggles with getting motivated to write, the popularity of super heroes and drawings might spark their interest. Rather than trying to get through paragraphs or pages of plain text, try shifting the format. Creating a super hero storyboard of panels with narration and dialogue can be more fun and intriguing, while still providing writing practice and expression. Another way to use comics is as templates. A parent or teacher can scan pages of comics and blank out the prewritten speech bubbles. The exercise would be to have to the student fill in the missing text based on the visual context. For example, what would this character be saying in this panel? Why would they be reacting like this? This scaffolding approach can be a fun different way to get students involved in the writing process. Comics can offer an alternative approach to writing with visual storytelling potential as well as a fun and educational writing exercise. So why not give it a try? This post was originally published on Southeast Psych’s blog. 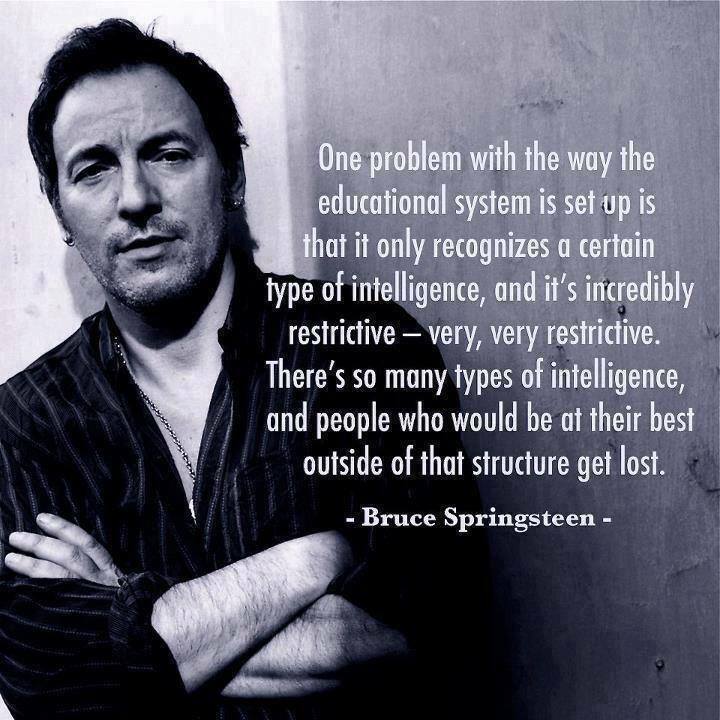 This Bruce Springsteen quote is from an old video interview, which was reported on author David Shenk’s Genius Blog. The image was put together by the folks over at We Are Teachers. In our books, this just reaffirms that he is, in fact, The Boss. We love Gabrielle Principe’s book, “Your Brain on Childhood: The Unexpected Side Effects of Classrooms, Ballparks, Family Rooms, and the Minivan.” Not only is her storytelling engaging and creative, it is also peppered with so much research that one almost needs an organizational chart to keep track of it all. While it is largely geared toward exploring the cognitive development of younger children, her framework for thinking about brains offers a compelling contrast to the current paradigm for understanding learning (performance on academic focused standardized tests) for all youth, and even adults. In chapter 1, Old Brain, New World, she sets the stage for what will be an book-long theme. When humans first appeared on the scene about two million years ago, families lived in small, nomadic bands and made their living hunting and gathering. Children spent their days roaming in packs and playing on their own in the out-of-doors. They improvised their own fun, regulated their own games, and made up their own rules. Children’s education was informal, and new skills were learned ou tin the world. such was childhood for more than 99 percent of human existence. Today, childhood is different. Infants find themselves strapped into bouncy seats and plunked in front of television sets. Toddlers are put away in play yards to listen to Baby Mozart and use learning laptops. Preschoolers are given talking dollhouses, robotic pet dogs, and battery-powered frogs that teach them their ABCs. Older children sit in front of computer screens with earbuds connected to their iPods, texting thir friends on their touch phones to see if they can come over and play video games. They spend their weekdays inside classrooms, seated in rows of desks, reciting times tables, drilling word banks, and memorizing state capitals. Their weekends are filled with activities that are organized, supervised, and timed by adults: sports leagues, private tutors, music lessons, math camp, dance instruction, karate classes, and Cub Scouts. 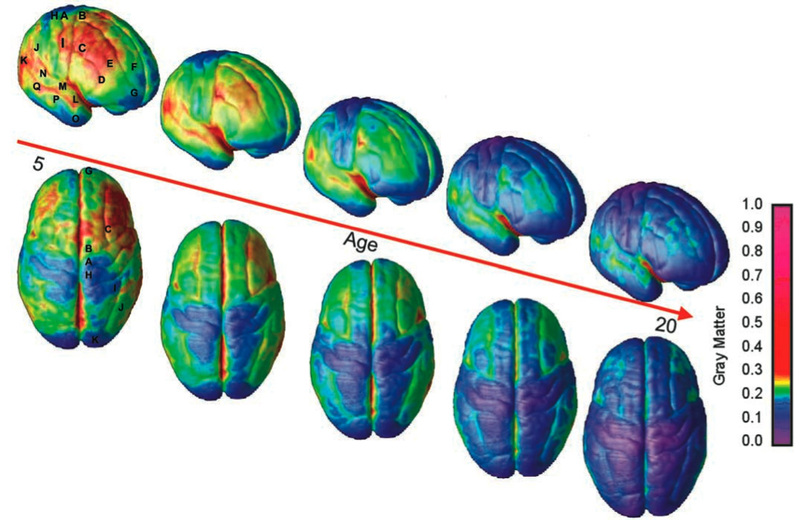 What does this recognition of the deep evolutionary history of our brains mean for children today? It means that their brains were not designed with modern life in mind; rather, they evolved for life in a very different world. At different times in teh brain’s evolutionary history, it developed in deep seas, freshwater streams, tropical rainforests, and the grasslands of the savannahs, not in classrooms, living rooms, manufactured playgounds, manicured ball fields, or minivans. These sorts of evolutionary novel environments have changed the way that children behave and develop, but today’s children still enter their respective worlds witha brain that never expected to find itself in any of them. It is this disconnect between childnre’s evolutionary past and their human present that makes parts of the modern world challenging and even damaging to the development of their brains, bodies, and behaviors. But the better we understand the long history of the human brain, the better able we are to raise happy, healthy, and successful children. So what is the point here and what does it have to do with youth, students, and education? Well, everything. While we would encourage you to read the entire book (because it is a great read all the way through), the main point is that we need to keep a perspective on the history of the brain and in what conditions it thrives best. Doing so may help us all better understand . . .
What conditions may better facilitate more holistic learning. The dichotomy between the current reform effort and the cognitive needs of all students.